Projects, Family Updates, and Always Food! No it’s not scorching heat that I’m talking about (actually it’s gorgeous with highs in the 70s and lows in the 50s! Perfect! ), it was just time to start baking with my favorite summer produce, the zucchini! Yeah, not what answer that most people would have I’m sure. 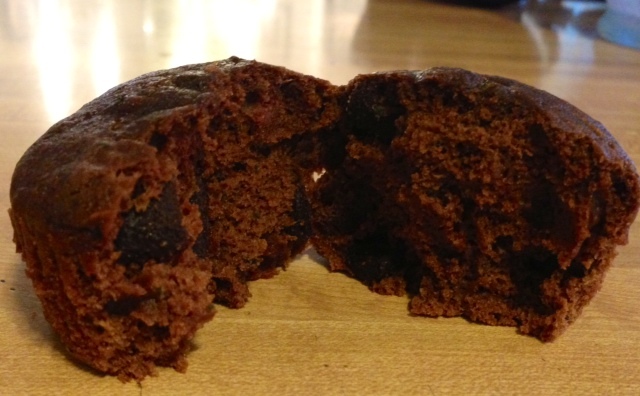 Delicious double chocolate zucchini muffins. Great for breakfast or a snack! We don’t have zucchini in our garden because Eric is not a fan to say the least. Plus they take up a lot of room, which we definitely don’t have room for. My dad on the other hand who has plenty of room for a huge garden, but he only plants two kinds of plants. Tomatoes and zucchini! While his tomatoes aren’t doing great this year (I totally won with the first ripe tomato this year! ), his zucchini are going gangbusters! He’s got a bumper crop and is picking at least 1 a day. I think my parents eat something with zucchini in it everyday. He and my mom came up this past weekend to visit, and he brought me a big bag of huge zucchini. I took most of them to work for my coworkers, but I kept one back for some baking for myself. I contemplated making regular zucchini bread for awhile, but since Eric wouldn’t be eating any of it (I keep telling him it only tastes like cinnamon, but he won’t listen! 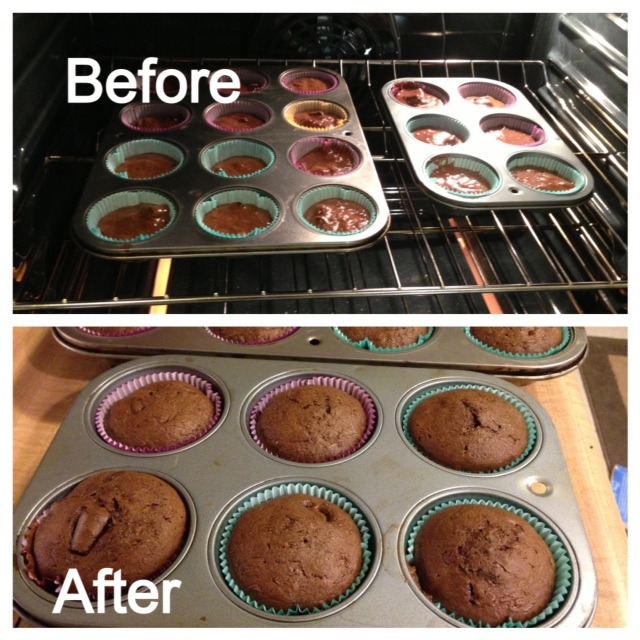 ), I decided to make some awesome double chocolate zucchini muffins! The best part of these (other than the chocolate) is that it takes 2 cups of zucchini, so I practically used up my entire zucchini. I wish I’d gotten a picture of it before I shredded it. Here’s the recipe I followed. It’s from simplylifeblog.com. They are fantastic. I made a couple of changes to suit my tastes. I added a little extra honey to sweeten it a bit more. Also, I didn’t fully ring out the zucchini to keep a little more of the moisture in. 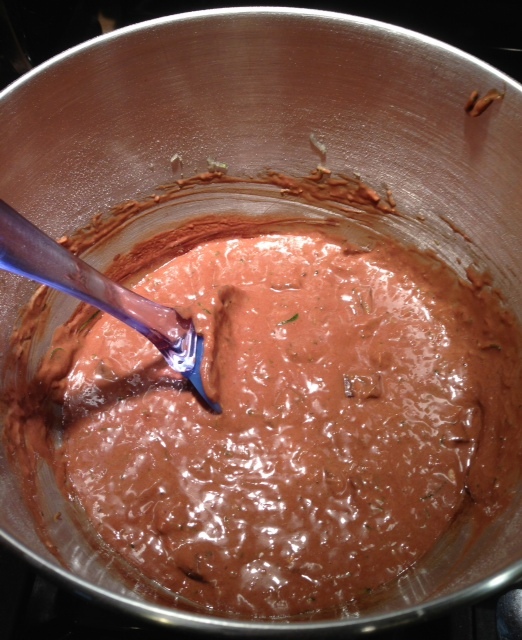 Lastly I added about a cup and a half of semi-sweet chocolate chunks instead of the cup of semi-sweet chips. I love them, which is good since I’ll probably be eating all of them myself…but I don’t mind! In the oven and when they came out! Warm and delicious! This entry was posted in Uncategorized on July 25, 2013 by lastu7335.